Forum » Mission architecture » Launch vehicle studies » The Comet Launch Vehicle? Topic: The Comet Launch Vehicle? 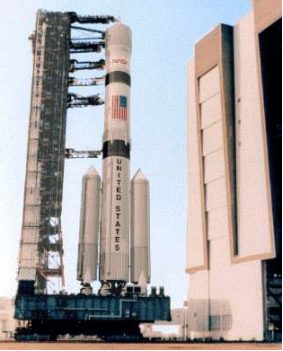 The Comet is a very attractive launch vehicle for a Manned Mission to the Jupiter system because of it's large payload to Low Earth Orbit (LEO) capacity. Originally designed for NASA's "First Lunar Outpost" study of 1992 it is capable of launching 254.4 tonnes into LEO orbit or 97.6 tonnes onto a Trans Lunar Injection. It's cost per kg to LEO is not especially impressive at a cost of $10,000/kg or about $2.6 billion/launch. However if each launch can deliver 254.4 tonnes into LEO, then only a small number of launches would be required to assemble a Europa bound spacecraft in LEO. What we need to do if we want to go to Europa is determine the amount of mass that needs to be sent up in LEO. The Discovery II Fusion powered spacecraft could make it to Jupiter with a initial mass in LEO of 1690 tonnes. That would require 8 launches of the Comet to assemble the spacecraft although it would need fewer launches to refuel it for later missions. If we decide on something with more mass it requires fewer launches, with more mass it requires more launches.